PLEASE NOTE - once your room confirmation number is received, a deposit of one night's room and tax will be taken from the credit card on your reservation. This deposit is refundable if a cancellation is made five days prior to arrival. 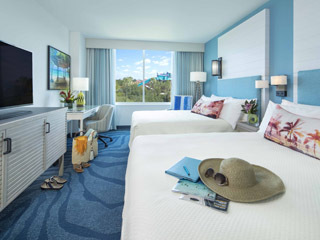 Hotel Overview - Loews Sapphire Falls Resort transports guests to a paradise in the heart of the tropics. Blue waterfalls cascade over lush grounds, and in the distance, the calming sounds of steel drums call guests to take in the scenic water views, ease into ‘island time’ and let go. Dining & Recreation - Enjoy a host of intriguing and exceptional dining options, from a full-service restaurant with scenic water views to a grab-and-go marketplace and a lobby lounge with tapas, ceviche and rum tastings. Experience the atmosphere of the Caribbean and relax by the 16,000 square-foot pool with a sand beach, adjoining fire-pit area and welcoming bar and grill offering fresh seafood and taste-tempting tropical drinks. Exclusive Theme Park Benefits - Guests receive exclusive theme park benefits including: Universal Express Unlimited™ ride access, Early Park Admission (valid theme park admission required), complimentary water taxis, shuttle buses or walking paths to the theme parks and Universal CityWalk™, and more! Universal Orlando Resort - Universal Orlando Resort is your ultimate destination, where you’ll find three amazing theme parks, non-stop nightlife and spectacular on-site hotels, all in one convenient location. 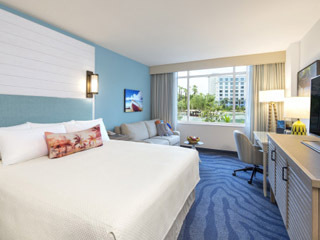 The tropics surround you in these stunning accommodations that feature two queen beds that can accommodate four guests, as well as all the comfort and amenities of our 321 square foot standard guest rooms. Maximum occupancy of 5 guests with a rollaway (fees apply). The tranquil view from this inviting room makes for the perfect retreat during your stay. These beautifully appointed accommodations features a king bed as well as all the comfort and amenities of our 321 square foot standard guest rooms. Maximum occupancy of 4 guests.